AMD’s EPYC processor has made it into servers and supercomputers, yet it still has to find its place inside workstations. To a large degree that is because up until recently there were no motherboards for these CPUs on the market. ASRock Rack was first to showcase such a mainboard at Computex. Now, GIGABYTE is coming up not with one, but with two ATX mobos for AMD’s EPYC aimed at workstations. GIGABYTE’s lineup of ATX motherboards for AMD’s EPYC consists of two motherboards, the MZ01-CE0 and MZ01-CE1. Both feature a socket for AMD’s EPYC, four PCIe x16 slots (as expected from a CPU that has 64 128 spare PCIe lanes) compatible with dual-slot graphics cards and accelerators, a PCIe x8 slot, eight DDR4 slots supporting up to 1 TB of DDR4 ECC memory, an M.2 slot for SSDs, and four SlimSAS ports for up to 16 SATA storage devices. 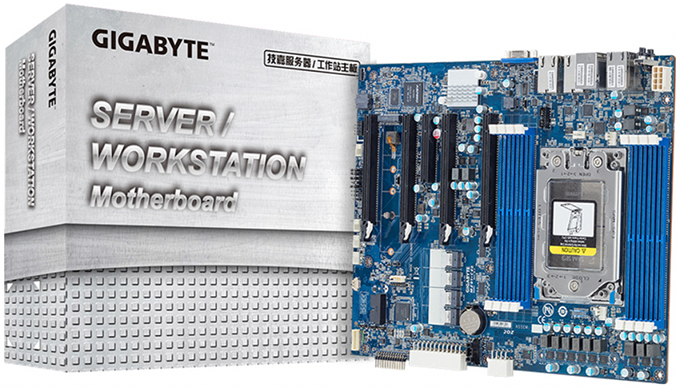 Despite being ATX-compatible, the two motherboards from GIGABYTE can be used to build both workstations as well as servers. The MZ01-CE0 and MZ01-CE1 platforms come equipped with Aspeed’s AST2500 BMC for remote management as well as GIGABYTE’s Server Management software. 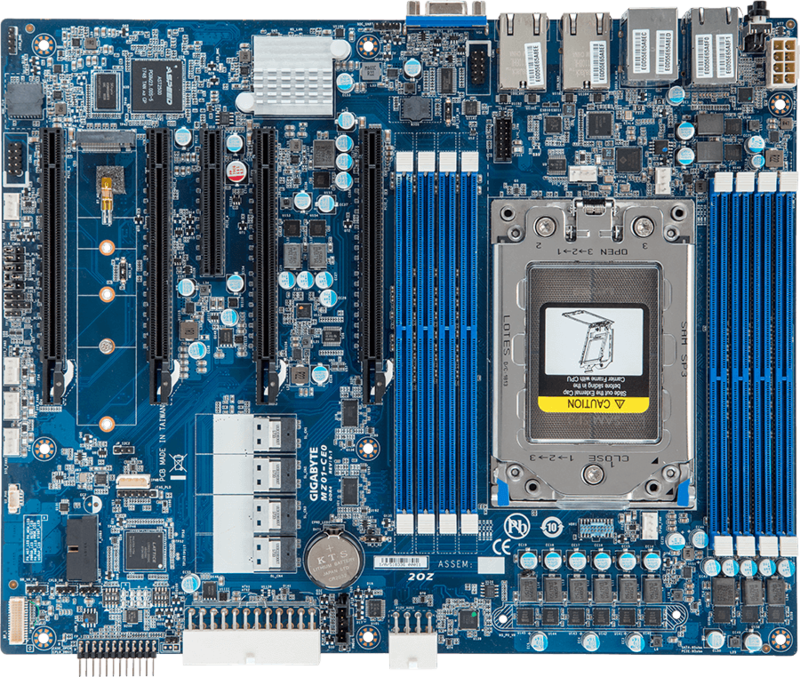 Both MZ01-CE0 and MZ01-CE1 motherboards come equipped with two onboard Intel I210 GbE LAN controllers. Meanwhile, the MZ01-CE0 is also outfitted with two extra 10 GbE Base-T LAN ports (controlled by the Intel X550 chip) for those who have appropriate networks for transferring large files from one system to another (something quite common in movie industry, for example). GIGABYTE has not touched upon MSRPs of its EPYC-supporting motherboards because they will be available mostly to B2B customers. Meanwhile, being unique products for server CPUs and equipped with expensive network controllers, the MZ01-CE0 and MZ01-CE1 will certainly carry premium price tags. Can any confirm the PCIe 3.0 x16 slot? 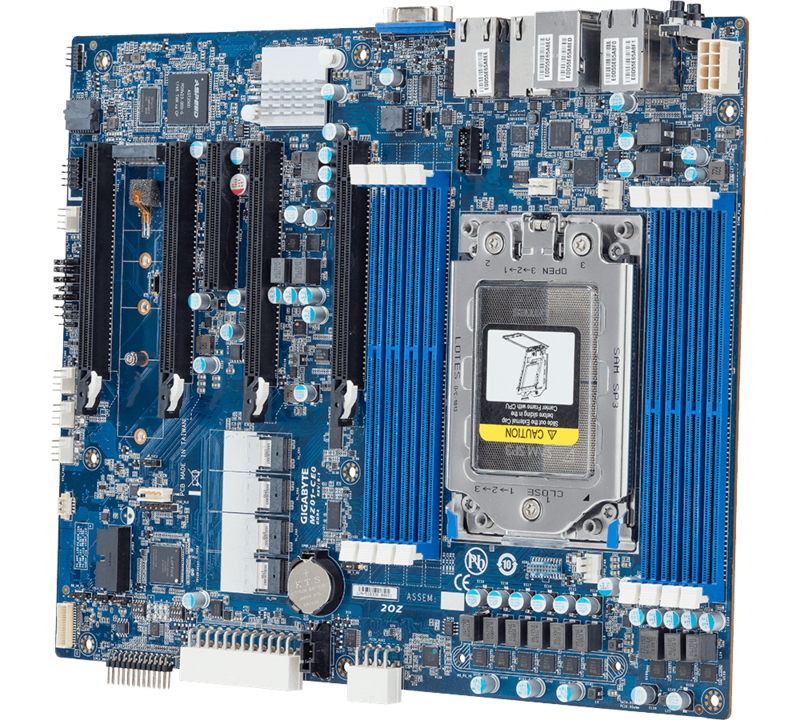 The MZ01-AR0 motherboard that these appear to be based on has PCIe 3.0 slots. We have one of those in our server room. 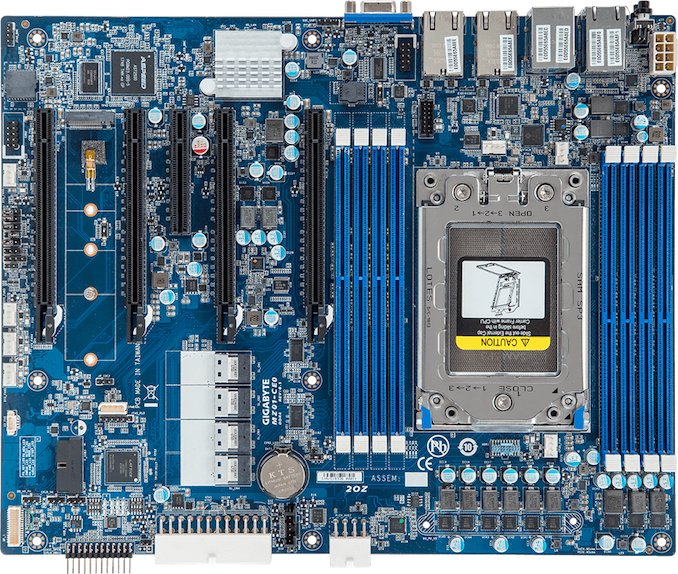 The MZ31-CE0 is pretty much the perfect motherboard for a storage server. Dual-10g Ethernet, 5 PCIe slots for storage controllers, and 16 SATA3 ports onboard. In which situation would you put an EPIC CPU in your WS instead of an Threadripper? In the end a big part of the total calculation power comes down to the power envelope available. Easy, with the 7371 that is being released, granted only a 16-core like my 1950X in my current workstation, you get 3.6GHz all core, 3.8GHz on 8-cores. So, it is roughly a 1950X but with the full accoutrements of 8 memory channels and 128 PCIe lanes. Seeing as I already have a 1950X that I've owned since release, I cannot justify the estimated $1400-1500 price of the Epyc 7371, but will be able to justify the switch to something like this when I upgrade the workstation. With the Asrock Epyc workstation board, it has more of the features that fit my uses than these Gigabyte boards, but with vendors now supporting such rigs, I have definitely made the decision to get something like that with the speed optimized Epyc 2 chips. I am still torn, though, as Zen 3 Epyc 3 should support DDR5, and justifying buying registered versus unbuffered is easier when moving to a new platform such as that (along with PCIe 5.0 being finalized likely in Q1 2019).